Good news: Bitdefender Internet Security 2015 offering 6 months free license key – Try it now free! Bitdefender internet security software is the most appropriate choice for you if you are looking for a complete internet security for your PC. Although, everyone are well familiar with Bitdefender Antivirus Software, but if you are new computer user and want to try a best antivirus software on your computer then this guide is perfect for you. Bitdefender is one of the most popular and trusted antivirus software for Windows operating system. In the field of internet security and antivirus protection, Bitdefender antivirus software is an award-winning antivirus and security software from Bitdefender. Three best antivirus solutions (popular products) of Bitdefender are – Bitdefender Antivirus Plus, Bitdefender Internet Security, and Bitdefender Total Security. All products of Bitdefender are renowned for best performance, best protection and easy to use. People are extremely excited and happy to use the exclusive features of Bitdefender internet security 2015. It includes antivirus, anti-spam, antispyware, one-click security, parental control, cloud antispam, two-way firewall, and many other useful features. Step (1): First of all, Visit to Bitdefender Promo page. Step (2): Enter your email address and then enter the security code (captcha code), finally click on “Get Free License” button. Step (3): Just after the click, Bitdefender will send you an email that contains your free 6 months license key of Bitdefender Internet Security 2015. Step (4): Now, check your email inbox to see the email message from Bitdefender containing license key. Step (5): Click on the link given in the mail (just below How do i install?) to go to the download page. 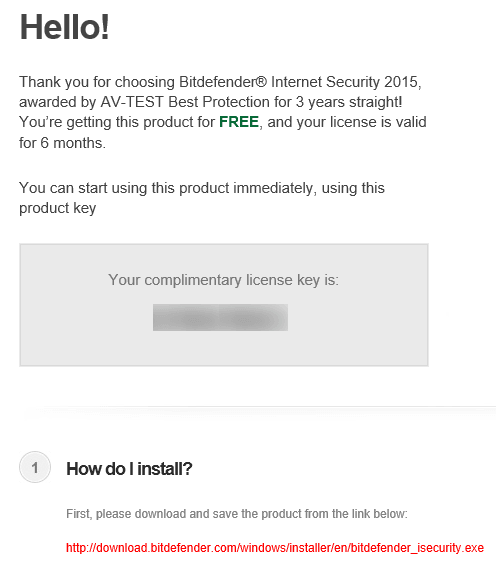 Step (6): From the download page of Bitdefender Internet Security 2015, download the installer. Step (7): After downloading the installer, Run the installer and follow on-screen instructions to complete the installation. Step (8): When it will ask you to enter the product license, simply enter the license key of Bitdefender Internet Security 2015 that you have received through email. Step (9): Once the Bitdefender installation process is completed successfully, you are free to use. That’s it! Now, enjoy the exclusive features of Bitdefender internet security 2015 free till 6 months. After using free trial version of Bitdefender internet security 2015, if you think it’s really one of the most useful antivirus programs and internet security software for PC then go for paid version of Bitdefender Antivirus Software. Get free 6 months license of Bitdefender internet security 2015 and share your valuable comments with us. What do you think – Bitdefender is the best virus protection and internet security software for PC? Thanks bro, i activated it very easily big thanks to you ! !